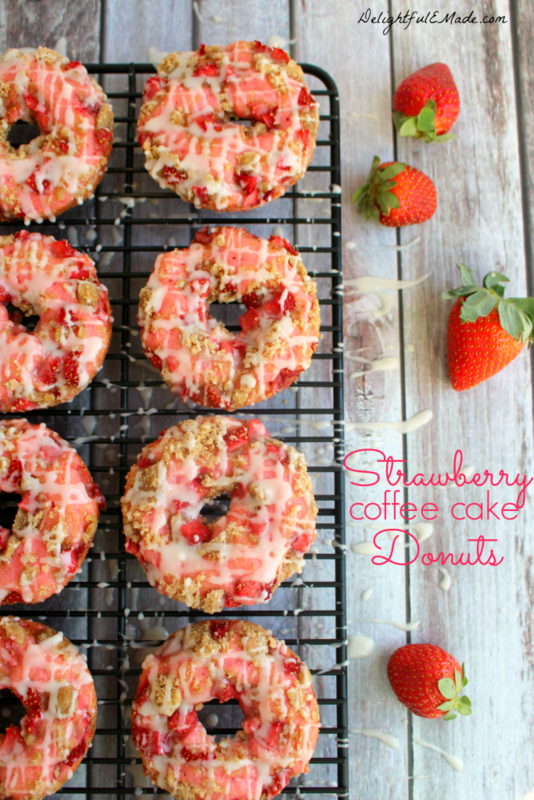 This past weekend, I made these beautiful and tasty donuts. The weather has been cold, dreary and down right depressing. I needed something to brighten our spirits and enliven our taste buds. These definitely did their job and left my family asking for more! 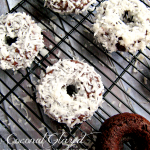 Baking a batch of these donuts are pretty simple. The batter starts with a simple cake mix and adding a few additional goodies. You’ll also need donut pans, as these are pretty essential in the donut baking process. I bought my donut pans at Bed Bath and Beyond, but you can also purchase them on Amazon. I would definitely recommend getting two pans. Each pan holds 6 donuts, and its nice to have an extra pan to rotate out when the other batch is baking. Once you have your batter prepared, spray the pan with non-stick baking spray and fill the donut cups (about 2/3 full). 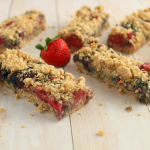 Top with some of the delicious struesel topping, and some additional chopped strawberries and get them baking. These donuts bake up beautifully, and will smell completely amazing as they come out of the oven! 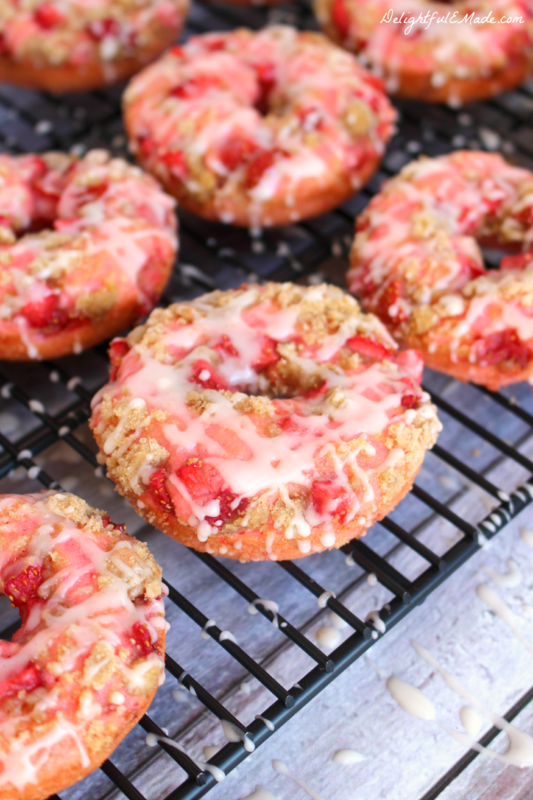 Let them sit for a few minutes in the pan, and then gently remove from the donut pan with a butter knife. Transfer to a cooling rack. Once cool, these babies are ready for glaze! 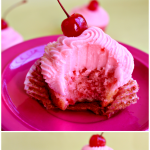 The pretty-in-pink breakfast treat – am I right?! 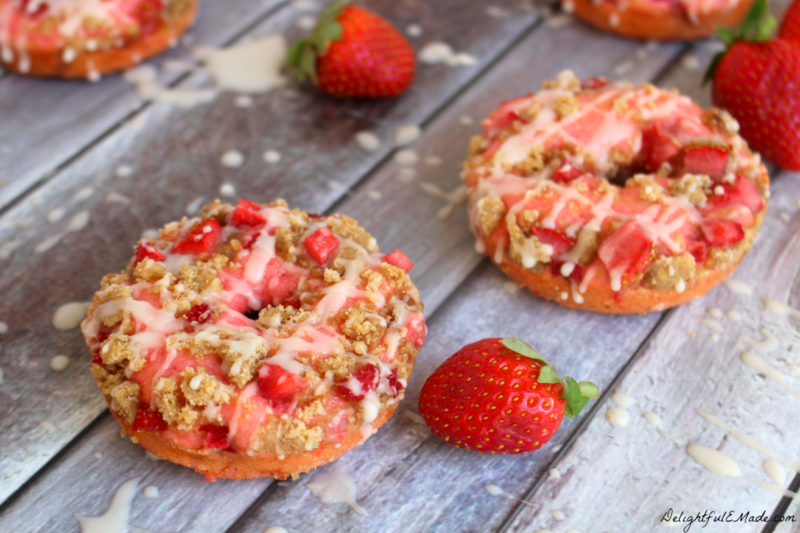 These Strawberry Coffee Cake Donuts are loaded with fresh, chopped strawberries, topped with coffee cake streusel and drizzled with glaze. 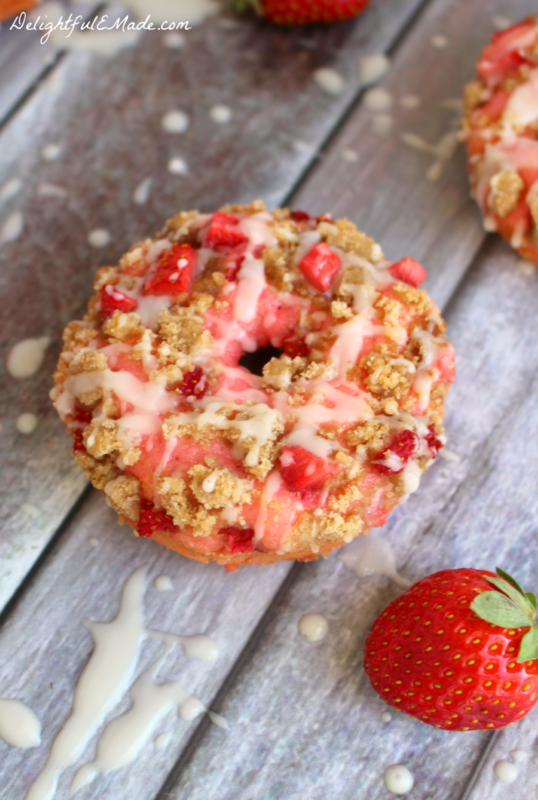 Breakfast treats have never been more pretty or tasty as these! Preheat oven to 350 degrees. 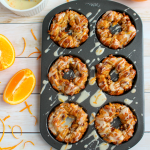 Spray donut pans with non-stick baking spray. Set aside. With a hand or stand mixer, combine the cake mix, water, eggs and 3 Tbsp. melted butter. Mix until smooth. Fold in 1 c. chopped strawberries to the batter. Prepare Streusel topping: mix flower and brown sugar. Slowly add the 3 Tbsp. melted butter, and stir to combine. Mixture will be crumbly. Assemble the donuts by filling the donut pans 2/3 full of batter, sprinkle on about 1/2 Tbsp. 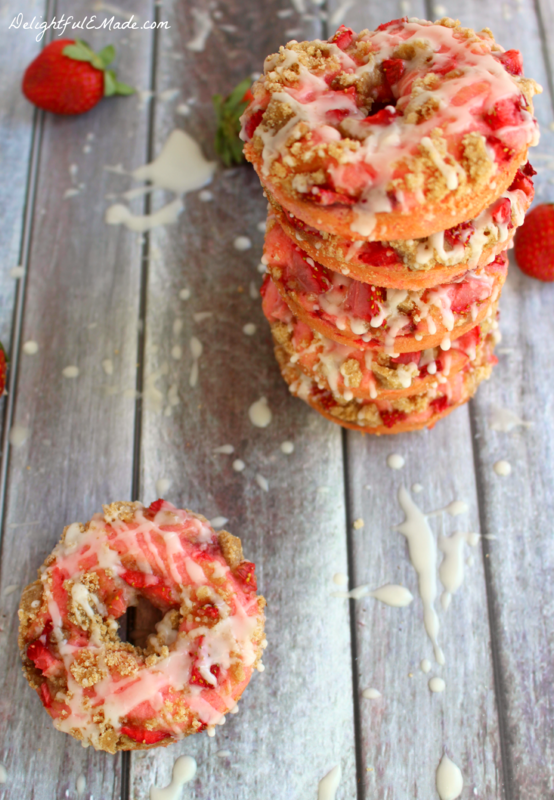 of steusel, and sprinkle with the additional chopped strawberries. Bake at 350 for 13-15 minutes. When done baking, let set in the pan for about 5 minutes to cool. Gently remove from the pan with a butter knife, and transfer to a cooling rack to cool completely. Mix the glaze by combining the powdered sugar, milk and vanilla. Stir until smooth and drizzle over the cooled donuts. Enjoy! There isn't a single thing I don't like about these donuts, and they've got so much depth to them too! 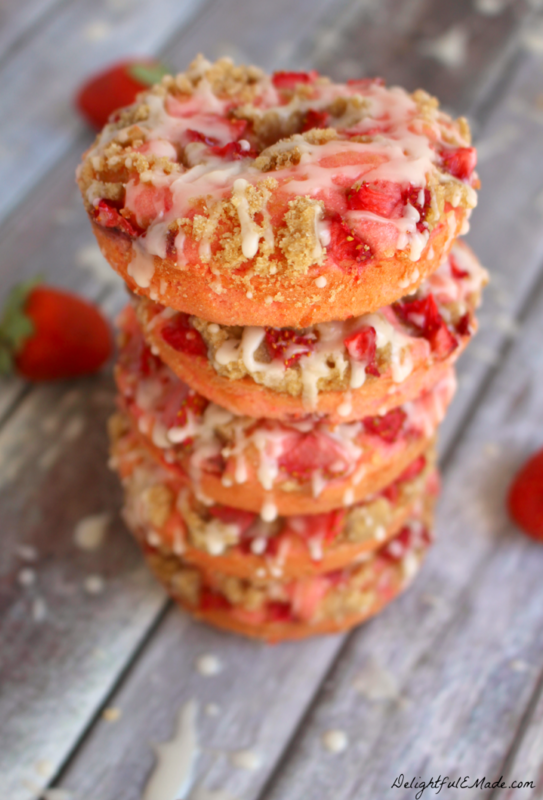 Strawberry cake, strawberries in the donuts, coffee cake topping and the glaze...they sound amazing! Do you use the large or mini donut pan? What a creative idea! Yum! These look SO delicious! I might make them for Valentine's day!! These donuts brightened my spirits for sure! They look delicious! Thanks so much for sharing at Oh My Heartsie Girls Wordless Wedesday. Check back next week. You are my pick and will be featured! These look amazing! 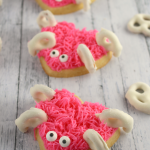 I think I'll make these for a valentine's treat. 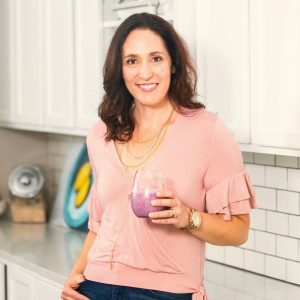 Thanks for sharing this delicious recipe with us. 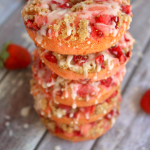 I don't have a donut pan, would this recipe work as a muffin? 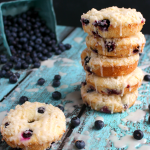 Could you make muffins instead of donuts?